My husband Todd is really fond of all things apple. 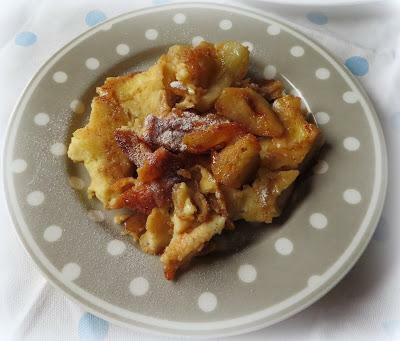 I had found a recipe for an Apple Pancake in The Breakfast Book, by Marion Cunningham that I wanted to make for him as a surprise one day this week. I just knew it was something he would enjoy! 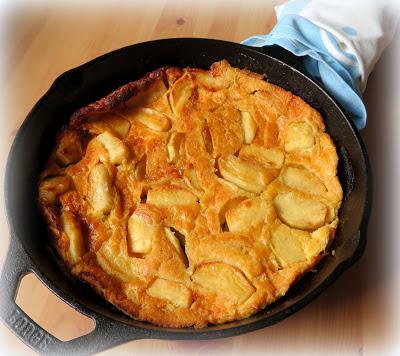 I decided to use my iron skillet as it was the right size and had an oven-proof handle. It came out of the oven all puffed up, but did deflate soon after. It looked beautiful other than deflating, and I could hardly wait to tip it out onto the platter I had ready to serve it on. I had a lovely image in my head about how it was going to look . 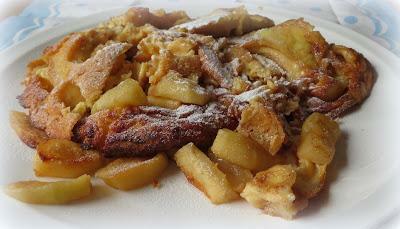 . . the apple slices all golden and caramelised . . . a froth of icing sugar dressing it up to perfection. I even ran a flexible spatula around the bottom of it just to make sure. TA DA! Not quite what I had pictured in my mind. 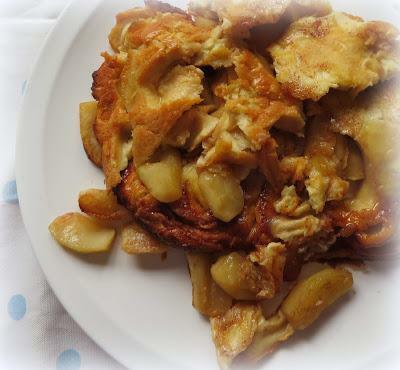 It came out in pieces, albeit lovely golden brown pieces, with lots of sweet soft apple bits . . . I don't think using a cast iron skillet was a very wise choice on my part. You live and you learn . . . I wasn't going to throw it away because it wasn't perfect. 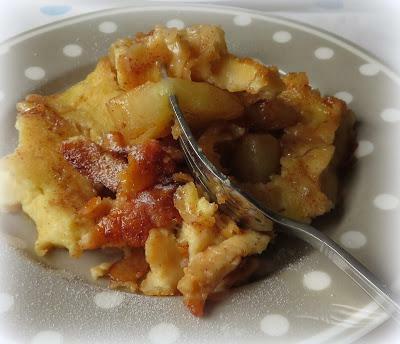 It looked sort of like this Amish pancake scramble dish I have made on occasion, so I did what any great cook would do . . . 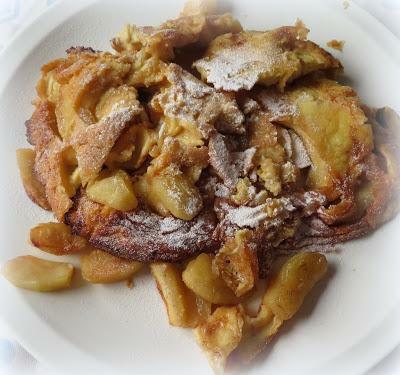 I dusted it with some icing sugar and I served it anyways. I think it looked rather nice with its frosty white coat! It tasted amazing! 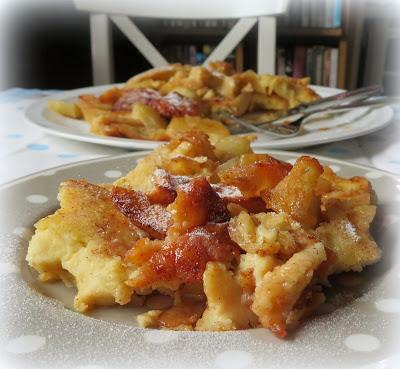 Crisp edged pancake bits . 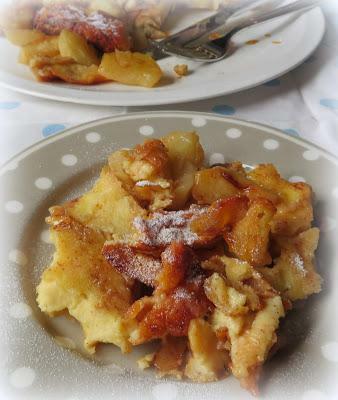 . .
Soft and sweet slices of apple, flavoured with cinnamon and cardamom . . .
We ate it just as is and enjoyed. I didn't add any syrup or anything. I don't think it needed it. I can imagine that breakfast sausage would go wonderfully with this . . . Even if it wasn't the prettiest gown at the ball . . . it still made a mighty tasty show! 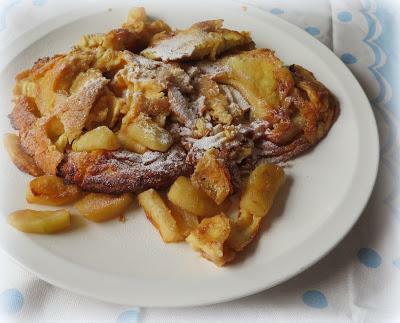 prep time: cook time: total time: A delicious combination of apples cooked in butter and a great big fluffy pancake! Preheat the oven to 230*C/425*F/ gas mark 7. Have ready a 10 inch oven proof skillet. If you need to, wrap the handle of the skillet in several layers of aluminum foil to protect it. Melt the butter in the skillet. Remove 2 TBS of the butter and set aside. 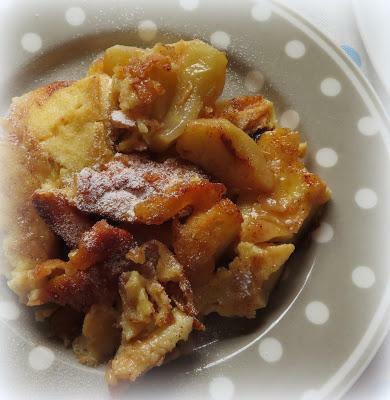 Put the apple slices into a bowl with the cinnamon, cardamom, icing sugar and lemon juice. Toss together to coat. Taste and adjust sweetness as needed. Turn the heat back on under the skillet. 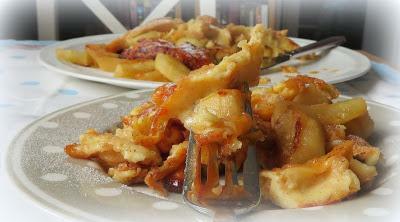 Add the apple slices and cook over medium heat, turning occasionally, until tender, but still holding their shape. 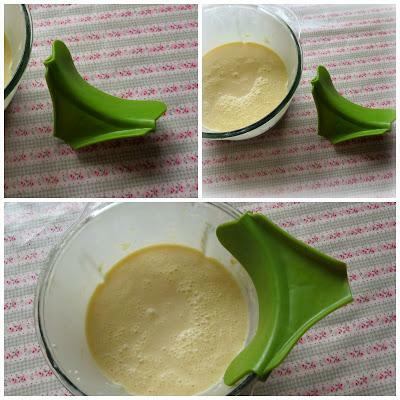 Whisk the flour, eggs, milk, salt and melted butter together until smooth. 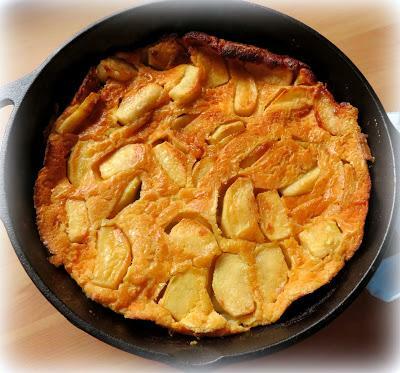 Spread the apples out in a single layer in the skillet. Pour the egg batter over top. Bake in the preheated oven for about 20 minutes, until puffy and golden brown. Turn immediately onto a warm platter so that the apples are on the top. 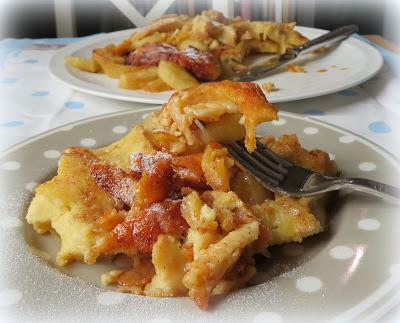 Dust with icing sugar and serve immediately. I learnt an important lesson from this exercise in taste . 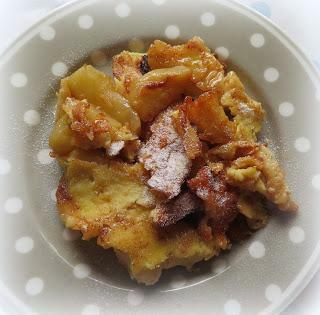 . . a light dusting of icing sugar can hide a multitude of sins, and just because something doesn't turn out looking the way you wanted it to, that doesn't mean its no good. This was quite simply delicious! Are you like me? Do you struggle with pouring liquids from saucepans or bowls into other containers? Oh, the messes I have made doing just that. Enter the Essential Bowl Clip On! Problem solved. Simplify your cooking with this useful bowl clip on. It is made out of food-grade, ABS premium flexible plastic and allows you to serve directly from the pot or pan quickly and without a mess. Perfect for soups or any liquids. I love this handy clip on kitchen tool. I find myself using it all the time! Free shipping on all orders to the USA, small shipping charge worldwide. To find out more, click here. 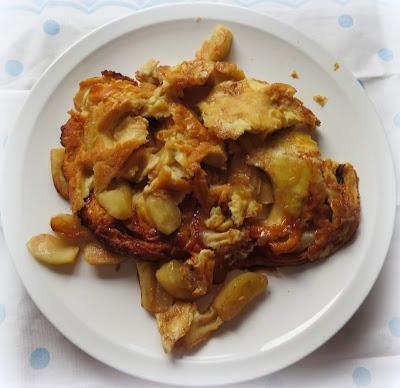 If you're looking for something tasty to cook for your family this weekend you can't go wrong with this pancake. 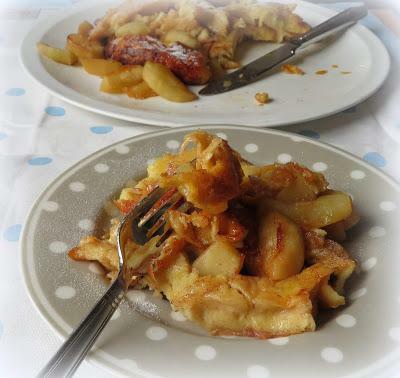 Broken up or whole, its simply delicious!